Island Magic is an upscale one-level home in the prestigious, gated community known as Hartstene Pointe, located on Harstine Island. It offers QUALITY. 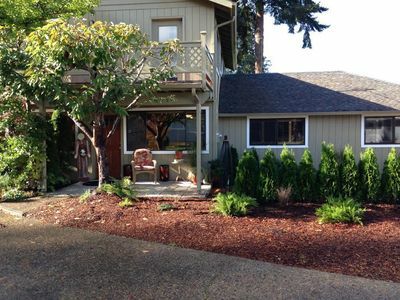 And compared to other homes at the Pointe or elsewhere in Puget Sound, the VALUE is also clear. Simply check out our rates. 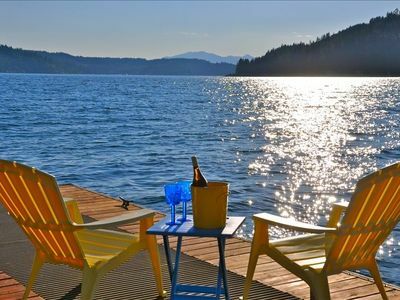 You'll see why many choose to make this their "home away from home." And it's wheelchair accessible with ramp to front entry provided! Let's take a tour. Please remove your shoes and enjoy the tiled entry hall covered with a wool Karastan rug. As you enter the carpeted Great Room, with its 12-foot vaulted ceiling and skylights, you see lush foliage through a bank of picture windows. No other buildings are visible. The greenbelt provides complete privacy. 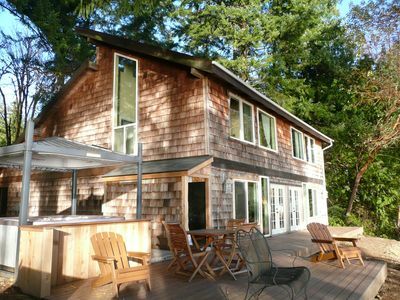 Step onto the 60-foot-long deck overlooking a deep wooded ravine. 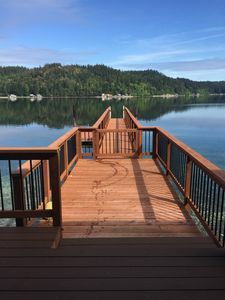 The deck itself adds 400 sq. 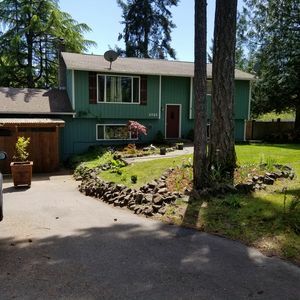 ft. of exterior living space to the 1600 sq. ft. inside. Once outside, the beauty, fresh scent, and absolute stillness of the forest enfold you. A path from the house connects with a winding trail seen at the bottom of the ravine. A 10-minute walk via this picturesque trail or by going north from 749 Promontory Road, and you're at Indian Cove beach. Indeed, you are never far from the water. 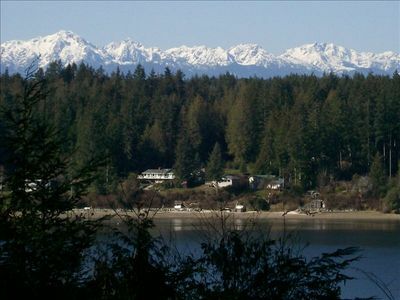 Walk out the front door, cross Promontory Road, and in 100 feet you are overlooking Puget Sound (Pickering Passage) and the snow-capped Olympic Mountains to the west (see Photo 1). 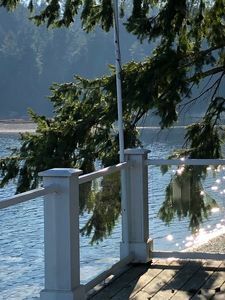 Indian Cove offers a covered picnic area as well as a 100-slip marina where both sailboats and powerboats are moored. Fish from the deck, collect shells, or dig for clams. 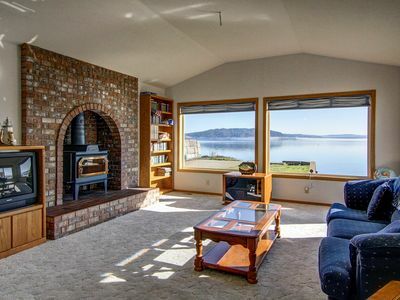 Returning to the Great Room, two comfortable couches focus on the Lopi woodstove (dry firewood outside) and the armoire that serves as an entertainment center. 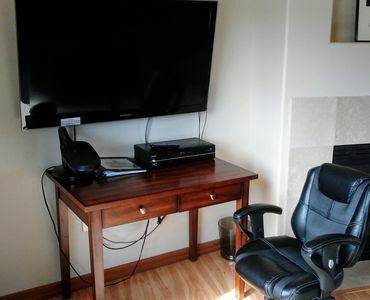 Open its doors to the wide-screen 26-inch HD TV, DVD/VCR player, CD Player, and Cassette Deck, all available for your viewing and listening pleasure. Enjoy some of the 300 newer films as well as movie classics, including Disney favorites. 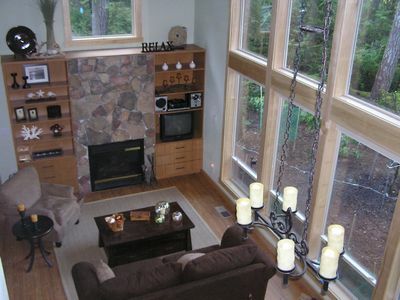 There is a second TV with VCR and DVD players in the 11' x 17' Master Suite. The Great Room also features a fully restored polished ebony 1980 Yamaha U-3 piano. This professional grade instrument has a gorgeous sound. Furthermore, unlimited CenturyLink High-Speed Internet is also available in the house. 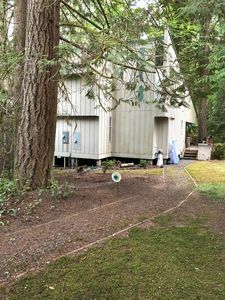 The house can sleep up to 8 people, with three spacious bedrooms, two full bathrooms, and a Natuzzi leather sofa Queen bed in the Great Room. The Master Suite as well as the second and third bedroom have comfortable Sealy Posturepedic Queen-size beds. You'll find a package of freshly laundered white sheets in each bedroom ready for you to make up. You'll also enjoy white bath sheets, hand towels, and washcloths as well as plenty of comfy pillows. When you leave, simply put the linens you have used in the laundry room. 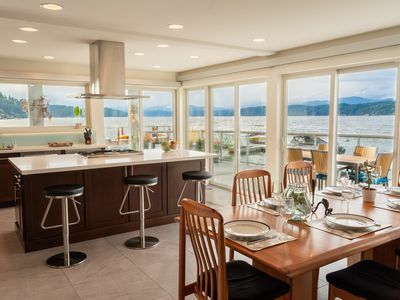 The dining area, with its American oak pedestal table, adjoins the modern kitchen. It has every appliance, cooking implement, and basic staples you're likely to need. The adjacent utility room has a large capacity washer and dryer. A gifted interior designer has combined antique furnishings, artwork, an extensive library, and memorabilia related to family, career, and world-wide travels into a pleasing whole. Island Magic is a perfect spot for a romantic getaway. In fact, our older son and his bride spent the first night of their honeymoon here. 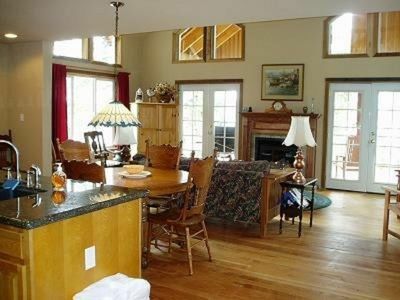 It is also an ideal place for a family reunion or a vacation with children. Young people can be seen riding tricycles, bicycles, and skateboards on the paved roads of our safe and kid-friendly community with a speed limit of just 15 miles per hour. Everything moves at a slower pace at the Pointe, with about 325 houses and 90 condos nestled in the forest and along the shore. Walking 5 minutes to the south from Island Magic brings you to the Pointe's Clubhouse. Its centerpiece is an Olympic-size swimming pool plus a children's wading pool and a hot tub with a capacity of 12. The pools are open from Memorial Day weekend through the weekend following Labor Day, and guests are asked to observe the posted regulations. Our two sons loved swimming here as they were growing up. Like the house, the Clubhouse also offers unlimited High-Speed Internet, along with a library, ping pong and pool tables (paddles, cue sticks, and balls are available at Island Magic). Across the road is our fitness center with state-of-the-art equipment. Hartstene Pointe, which is on the northern tip of Harstine Island, provides many other amenities to residents and guests, including swings for kids, 3 tennis courts, 5.5 miles of walking trails, and 3.5 miles of beaches and lagoons. You may want to bring a canoe or kayak to launch at Indian Cove. Use the two bikes and helmets in the garage to explore the Pointe as well as the 10-mile-long island beyond the gates. 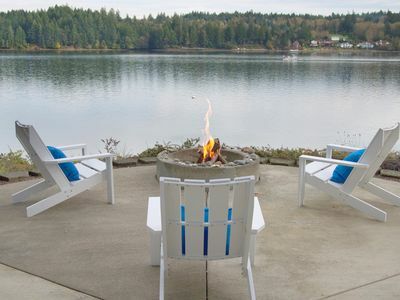 Founded in 1971 as a planned community of 231 acres with underground utilities, abundant common areas, and a carefully managed forest, the Pointe is often called 'paradise found' -- a unique destination in the Pacific Northwest. 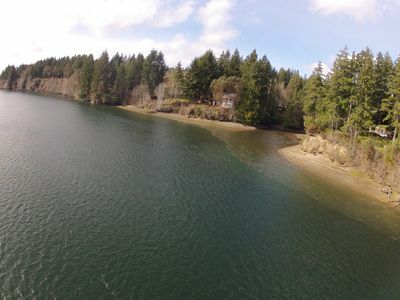 Harstine Island itself is located 25 minutes from Shelton, Washington, and is accessible via the Harstine Island Bridge from Highway 3 between Bremerton and Shelton. 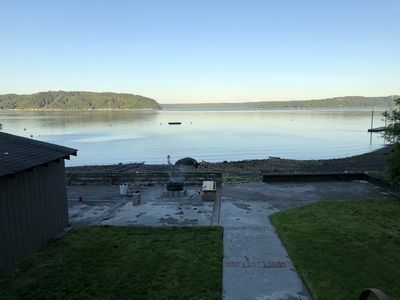 The island is the third largest in the South Sound (after Vashon and Bainbridge) consisting of 19 square miles with 25 miles of shoreline. 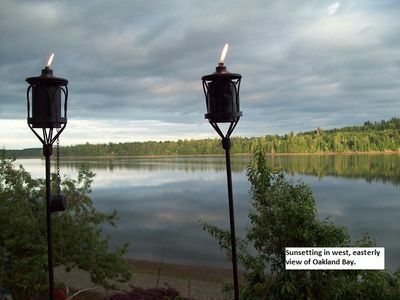 Harstine is non-commercial and rural, with dense forestation and abundant wildlife. Deer frequently wander by the house. 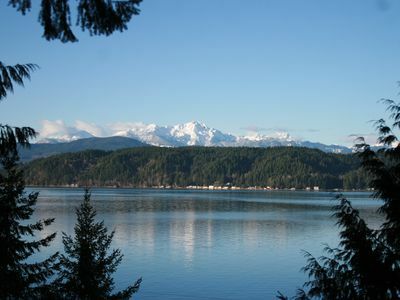 Island Magic is also an ideal base from which you can explore the town of Shelton, scenic Hood Canal, Alderbrook Resort and Spa, the Olympic Peninsula, and nearby cities and towns such as Olympia, Port Townsend, Bremerton, Poulsbo, and Gig Harbor. 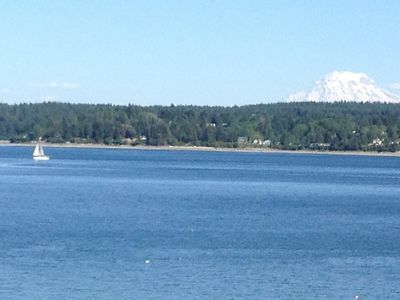 One scenic route from Sea-Tac Airport entails a 30-minute ferry ride from Fauntleroy to Southworth. 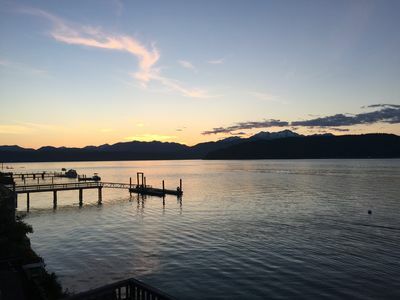 From Southworth, Island Magic is only a 60-minute drive via Gorst, Belfair, and Allyn. We offer QUALITY and VALUE. Please give us a call or send an email with you phone number. We respond quickly to all inquiries. 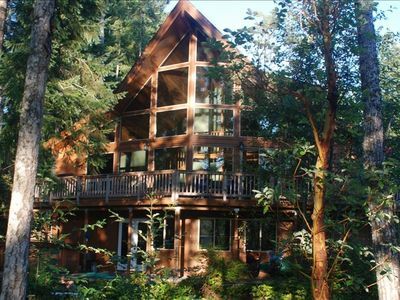 Fun adventures for you at The Lodge on Oakland Bay! Pebble Beach Place 'Our Place is Your Place'!